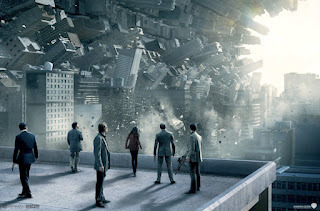 In the film, the protagonists use a special machine to shape and design dreams based on their imagination as well as their personal experiences. In prayer, we examine and re-live our experiences, allowing the Spirit to illuminate moments that teach us about how God was at work in our life. The Spiritual Exercises particularly emphasize the sensations of prayer, as when Ignatius advises the one praying to see the scene in detail, to hear its sounds, to touch, smell, and taste as the data of the senses connects one more closely to the experience and to God. For instance, in contemplating the nativity, one might imagine the stables, see Mary and Joseph, and even imagine holding and caring for the infant Jesus. This brings one's own memories of infants and of other experiences into the reality of the prayer. One of the difficulties in prayer is to avoid forcing a certain result. We may desire to experience peace in prayer and instead surface disturbing feelings and images. The important thing to remember is that God works in all emotions and memories, not just the ones we like. This involuntary aspect of dealing with painful memories is explored in the film as we discover that the protagonist, Cobb, keeps a hidden layer in his dreams: one he has forbidden anyone to enter. This layer contains the memory of his wife, who died tragically. No matter what Cobb tries to do, the memory seeps in, throwing his plans into disarray. Prayer is a way of exploring and healing painful experiences, as Cobb must eventually do in his dreams. This may involve a crucifixion moment or leap of faith. The central issue of the film is the ambiguity between dream and reality, perception and fact; and the way to get to the real world is to abandon one's perceived reality in a kind of crucifixion moment or leap of faith. Waking from the dream involves a violent shock. In the extreme case, if the dreamer is trapped in the deepest level of dream, the only way out is to enact one's own death. This is a leap of faith, hoping that the perceived reality is unreal and that the truth awaits the one who is willing to risk it all. But if you're wrong, you're just dead. In Christian prayer, the leap of faith is not to die literally but to lay down one's life in service. The Spiritual Exercises invite the one who prays to emulate Christ in making a total gift of self for God and for neighbour. Our perceived reality is that we must sustain ourselves and gain control over our environment. To reach the truth, that love is not finite, we must risk losing control over our own lives in surrender to God. This process of leaping in faith leads to a healing of wounds and a spiritual resurrection into a wakeful, real world. This reality is the reality of grace. 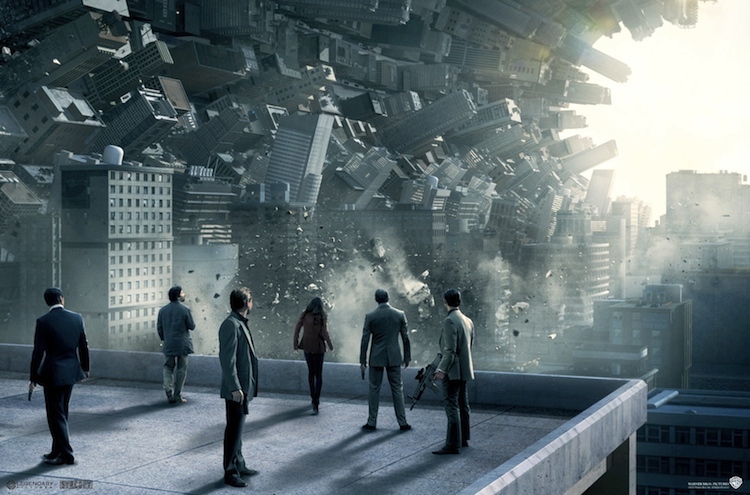 Inception is about planting an idea in someone else's mind: and yet the only way Cobb can achieve this is to create a context in which the intended target of the idea receives it according to his own identity and beliefs. The result of this planting of idea is that the target awakens with a strong desire: I wish to be my own person and not merely emulate my father. But, the protagonists realize, they cannot implant an idea unless the conditions for its realization are already present, deep inside. The Spiritual Exercises do not plant an idea but understand the idea of God always already to be present. The exercises create a context in which the one who prays discovers God according to her own experiences and through her own leap of faith. The one who prays is invited to let her faith develop. It grows to the point that she can entrust her life to God with the hope and the belief that God will return the gift and love her such that she becomes more completely herself. Again, this true self was already present, deep inside, waiting to be realized. For the film, it remains ambiguous whether our waking life is real or merely an idea. The Spiritual Exercises attempt to overcome this ambiguity through faith. In Inception, Cobb's faith in who his wife was, and his love for his children still living, lead him to reality. Through the Spiritual Exercises, we discover that it is our faith in and love for Christ and neighbour that lead us to a reality that goes beyond ideas and perceptions and leads us to truth.